They are basic bullet points but they will intertwine with one another and all of the items will be constantly changing. I have always hated starting projects as I have either too many or no ideas at all and I am never sure which one to pick. Dismissing an idea that could have been amazing and picking another idea which isn’t going anywhere is a horrifying thought. However, I am sure many illustrators go through this process and the only way to combat it is to face the challenge and experiment. Due to having restricted time on creating this book, I can start to appreciate why established authors and illustrators take a long period of time to create a children’s book, as it is a slow but carefully planned process. Before I started creating rough storyboards I didn’t really know where to start and so I thought I would research into the characters home. This allowed me to start to visualise the scenes and how I could play with the storyline to fit within the area. Also, depending where the character lived could alter his personality which is going to be developed later on. 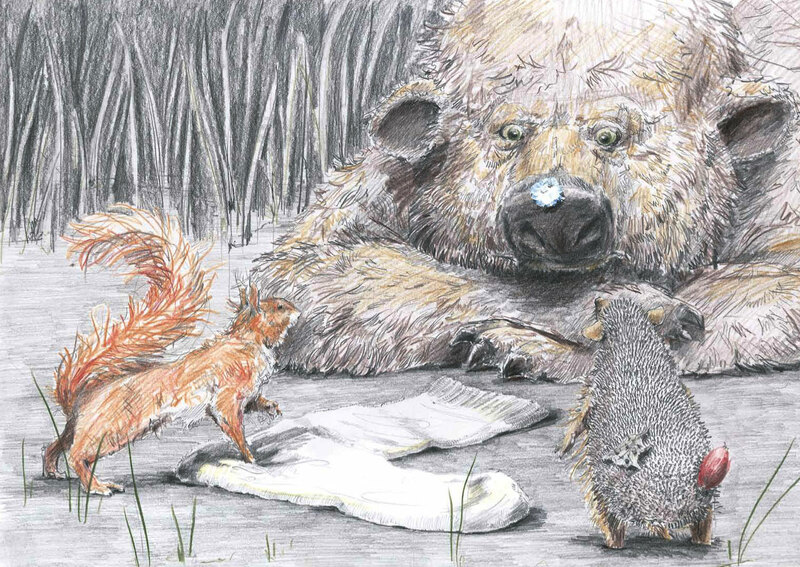 When creating the rough storyboards I decided to look at some more picture books which included squirrels but to specifically look at how the author and illustrator laid their story out. From this I could see which stories worked and flowed as well as deciding what I didn’t want. 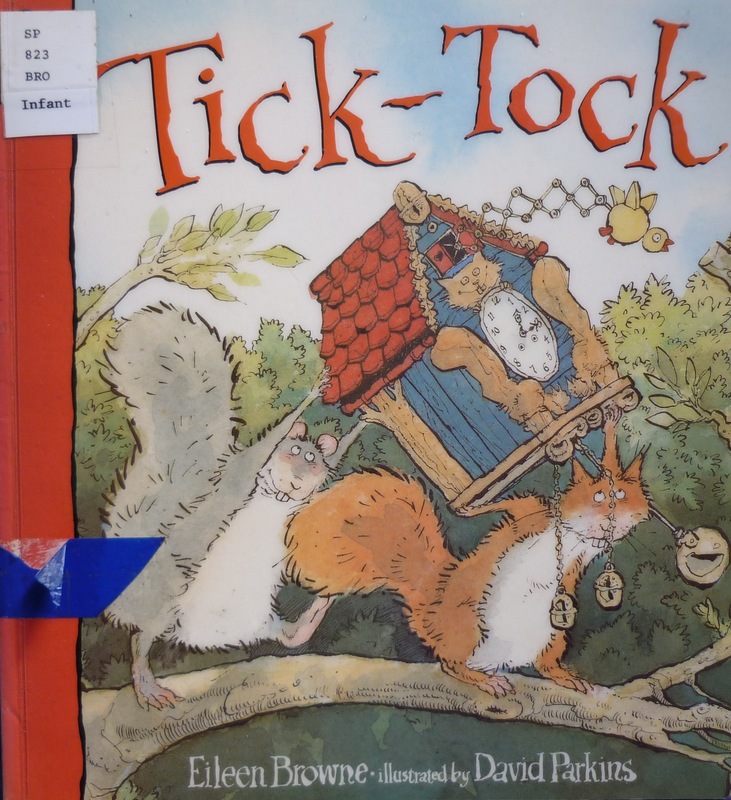 Here is one of the analysis from a book called Tick Tock created by Eileen Brown and illustrated by David Parkins. 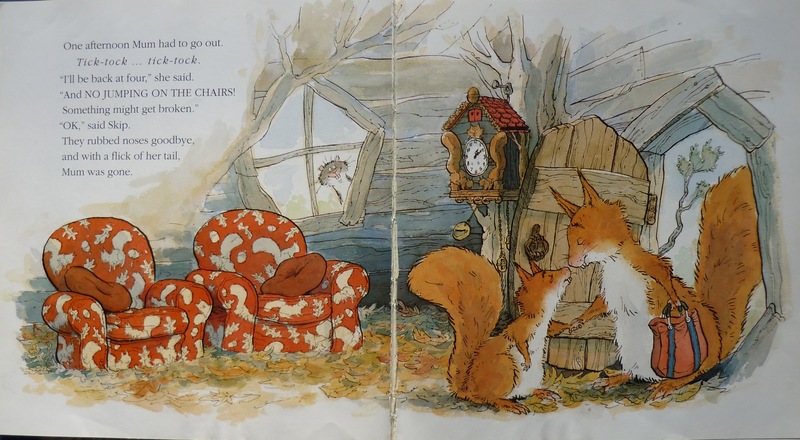 A story about Skip the Squirrel who breaks her mum’s cuckoo clock, it’s a race against time to fix it before mum gets back. 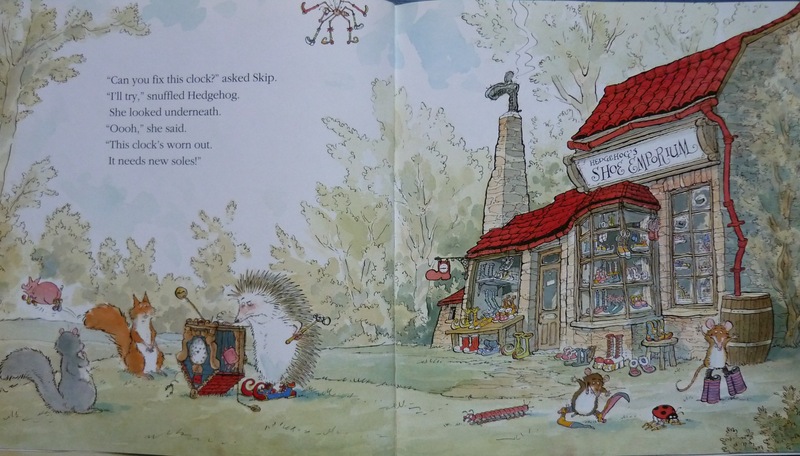 Visiting two characters, the Weasel and the Hedgehog who unsuccessfully fix the clock but they soon reach the Owl who fixes the clocks but they don’t have time to test it out before they place it back in the Squirrels house. They think they have achieved the impossible but as you would find out, the clock does not go Cuckoo Cuckoo anymore it sings Tu- Whit-Tu-Whoo! Stripping the story down to the bare minimum. From looking at the basic storyline I could see there were set amount of pages for the beginning, middle and end to the story. Including the front and back cover, copyright, title page and the two sets of end pages the book is 32 pages long which is the standard size. I was surprised because they had fit so much in within the book, which has adventure, humour and characters as well as the sense of time passing which can be hard to achieve. 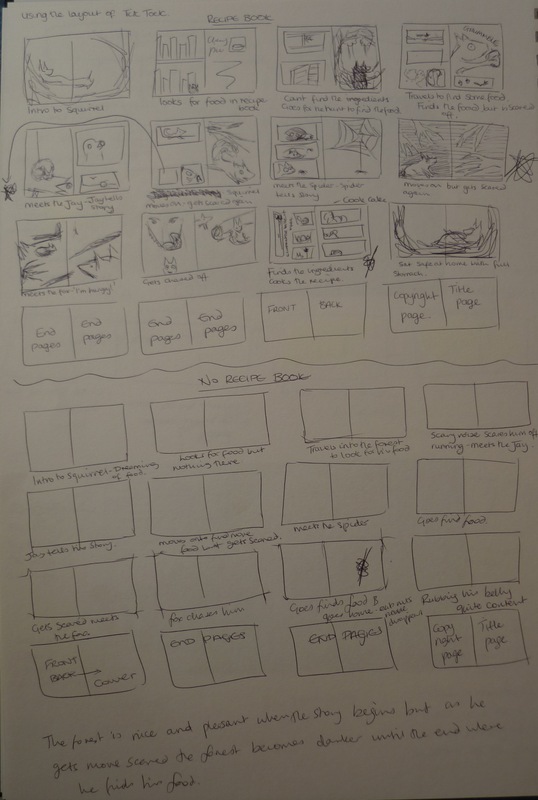 After looking at this book I found my story has a similar layout and so I thought I would attempt to use this a basic guideline when creating my storyboard. I will be also looking at The Gruffalo again which was created by Julia Donaldson and illustrated by Axel Scheffler as they have a similar layout. Even though both of these books aren’t amazingly new and they use a popular layout, they make the book their own and tell their strong story with great excitement which I want to achieve. BBC, n.d, Oak Wood. [online] Available at: http://www.bbc.co.uk/nature/habitats/Ancient_woodland [Accessed 23 January, 2015]. Browne, E., 1993, Tick Tock. London: Walker Books Ltd. Size of book – A4? A3? Custom size? Character development – the character will be a squirrel and so I want to gather a lot of material on the body, animal interactions, behaviour etc. Research on how other illustrators have perceived the animal as well as working out what the personality my squirrel has. I tend to draw a couple of sketches of the main character and then stick with them through the book which I noticed restricts a lot of potential aspects of the book, so I want to draw the character repeatedly so I understand how it works, feels and looks. I want to learn that it doesn’t matter if one drawing goes wrong when I have just drawn a good one as it’s all part of the learning and I want to let go of being over protective of every aspect of my work. Background development – more realistic with unusual angles due to the main character being a squirrel. Gather photos and other media on the specific season. Pacing – fast pacing and then some steady pacing. I was also thinking of including specific pages that refer to the past, do I use a slightly different medium to clearly show a different part of time? 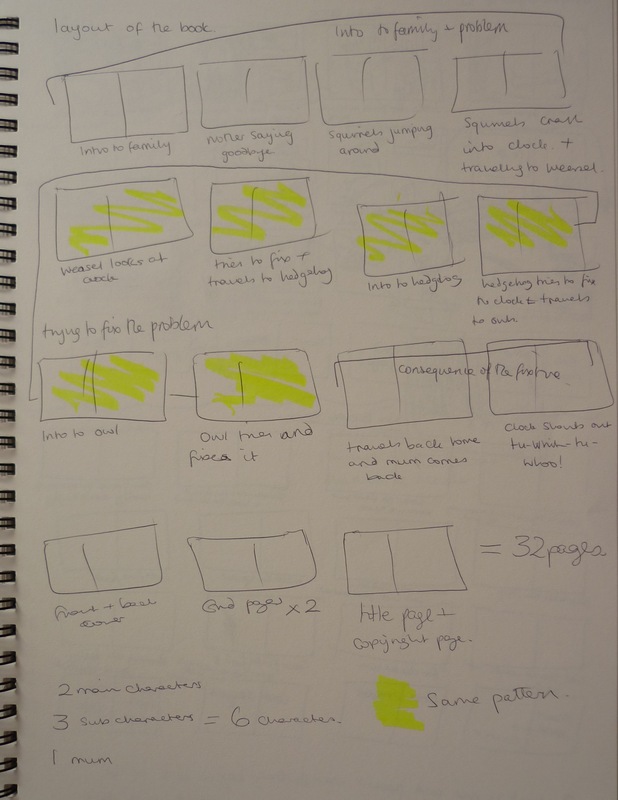 Layout – Am I going to use the characters to interact with the actual physical book or keep the layout simple. 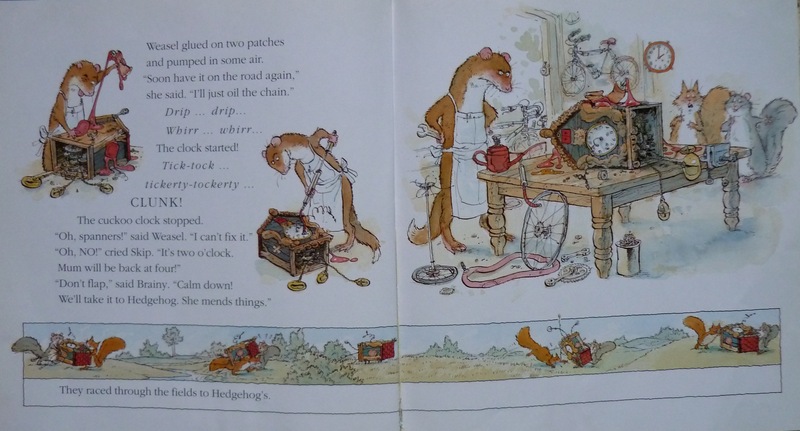 Framing – Do I stick with the same framing like the Gruffalo by Julia Donaldson or do I keep changing it depending on the pace of the story. Colours – Is it going to be full colour throughout or do I change the colours depending on the mood which would change the atmosphere of the scene like It’s a Book by Lane Smith. I want to become fully involved with the development of the story, to experiment and become immersed in it’s world. To understand what professional illustrators and authors go through even though there are never two stories the same. At the end I would love a publisher to pick me up and want to work with me further but this will be a massive challenge and dream but one that I will not give up on easily. This entry was posted in Tasks for next semester. The problem with life sometimes is what you plan doesn’t always well… go to plan. I have achieved many things in this short time such as completing a dissertation, starting the development process of my children’s picture book and I am excited for what is coming in the next term. The dissertation took a large amount of time that I wasn’t really expecting but it did help me a lot in understanding my area of interest regarding the educational value books can have and how children’s books help children to develop their own interests and life skills. Also it helped me to focus what I wanted to create, not just a picture book but one that combined educational information within the narration which also includes fictional aspects. Due to the time restriction that the dissertation caused even though I stuck to my schedule, I didn’t create as much material as I had hoped for but I think I will have more research when I start to develop the book next semester. I found it is harder to think of a story than I originally anticipated and can see now why other illustrators and authors can take years to develop a story (which I didn’t understand previously) as there are so many out there but it is choosing which one is the hardest part. 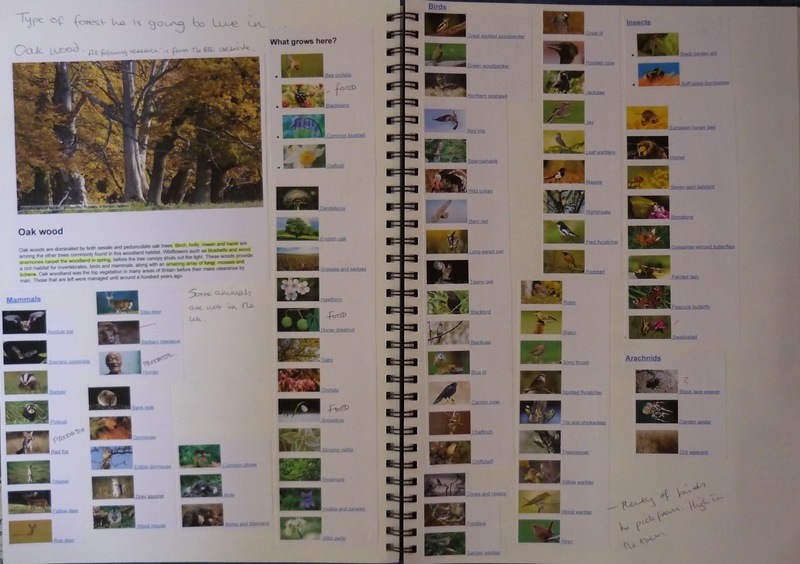 Analysing picture books – I completed this whilst working on my dissertation and it helped me when analysing three contemporary picture books in my essay. By looking at other successful books old and new, I was able to see how many different ways stories can be illustrated and laid out. From this I was able to set a rough criteria of what I wanted to include which I would follow when I am starting to create a storyboard. Taking photos of the woods – I still haven’t decided fully what season it is set in and even though I will take photos now, it may look completely wrong if I decided to set it in summer as the course will be finished by the time we reach that season. However, I have many photos in my albums that have been taken in the summer and so I will be able to use this as a reference. Also due to the recent snow it has been harder to access the woods due to the roads and climbing slippery trees is out of the question. Creating more blogs – I felt more pressure to think of something amazing for my story due to the restricted time. However, this will definitely change for next term as my full attention will be on this project and there will be a lot more development in my work. Creating two to three stories – I technically created many stories but it’s choosing which one is the hard part. I wanted to have a potential story in front of me that excites me and makes me want to start developing it now. This has been hard as I have either been side tracked with other jobs or I have focused too hard on this perfect story and haven’t allowed myself to sift out the bad ideas which eventually allow the good ones to shine. However, after many brick walls so to speak, I feel that I have created two strong stories that have a lot of potential in them and will allow me to explore my imagination whilst keeping it grounded with educational information. 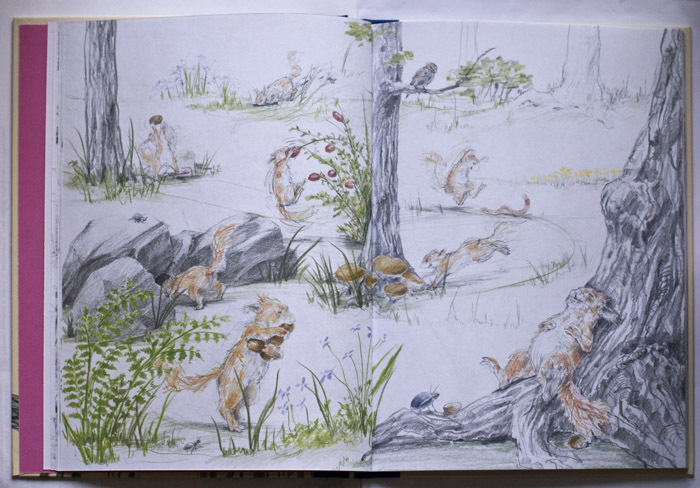 Creating Sketches and photos of the woods and squirrels – By the time I decided to choose the woods as the background and the squirrel as the protagonist it was Christmas and because my Grandma passed away unexpectedly I haven’t created as many sketches. However, now I know my story, character and background I will be able to start generating ideas, sketches, character development and start to dive into the project next semester. In this semester I wasn’t able to start contacting outside sources such as publishers etc, as they wouldn’t have taken notice of me if I went to them now with a very rough idea but nothing to show. This is why I am waiting until I have cemented the core of my idea and have generated some work for me to show them, which would hopefully interest them or at least make myself known for future work. Also, to test my concept I will hopefully be able to share my book with my target audience. There is no point doing this now with children aged five, as I will not be able to hold their attention unless I had something to show and I want to see how they engage with the image as well as the story. So the Christmas celebrations have finished and the New Year begins. Over the Christmas period I tried to do a little bit of work here and there but I didn’t do much as unfortunately my Grandma died 3 days before Christmas and so work obviously took a back seat. I can find them pretty much anywhere so I can easily draw them compared to another animal such as the zebra which I would have to go to the zoo every time to draw them or go abroad (pricey but fun). After creating some sketches of squirrels they are fairly tricky to draw and have odd shaped bodies the more you loo at them but I like a challenge. They climb high trees but also rummage on the ground and so I will have lots of options on angles and perspective when I start drawing out the storyboard. Even though they are found in gardens, I like the idea of the woods as the background setting. It allows me to play around with subplots of other characters in the background. 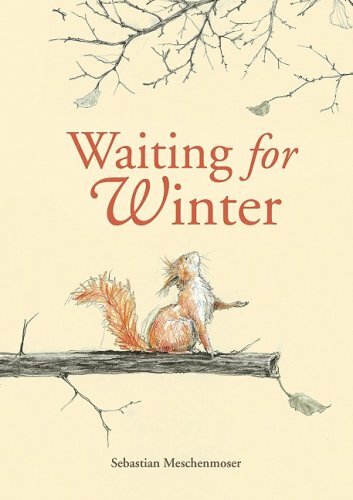 After previous research, there aren’t many books that have a squirrel as a protagonist which surprised me. But as Martin Salisbury previously commented, mice, bears, cats and dogs are the most common animal characters. 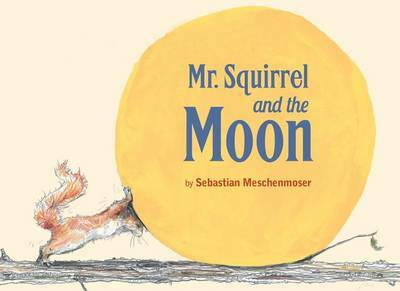 One book that I did find whilst researching was a book by Sebastian Meschenmoser called Mr. Squirrel and the Moon (2015). A beautiful front cover that is simple yet engaging. The protagonist taking centre stage looking up for the snow, the palm of his hand facing upwards mimicking the human action waiting or feeling for something to land on his hand. It could also look like he is looking at the title looking sad with his ears pinned down realising he may have to wait for a long time. I also noticed that the title has three styles of text. Standard type for Waiting and then italic for for but then only the W is italicised and the rest of the word is normal. Interlinking the previous styles in the last word. I like this style and would test this out when I come to creating my front cover. The illustrations are quite rough creating texture and depth but they also have specific colours that stand out stopping it from becoming a dull picture. I looked on my Universities library to see if they had this book but they don’t which is annoying and I could request an inter loan but last time I did this I still haven’t got the book and that was for my dissertation which has finished. So I may have another go at trying to find it but we’ll have to wait and see. By finding this book I will have to make sure that I do not copy or replicate the story or style as this won’t help me to create a new and exciting story. Сундучок вдохновений, n.d. Sebastian Meschenmoser. [internet] Available from: https://darinovis.wordpress.com/2013/02/26/sebastian-meschenmoser-себастьян-мешенмозер/. [Accessed 1 January 2015]. Jordan, L., 2010, How to write for children. London: Piatkus. Jules, 2009, Featuring Sebastian Meschenmoser. [internet] Available from: http://blaine.org/sevenimpossiblethings/?p=1861. [Accessed 1 January 2015]. Meschenmoser, S., 2015, Mr. Squirrel and the Moon. Anon: North-South Books. PopBop, 2014, Clever Three Times. [internet] Available from: http://www.amazon.com/Mr-Squirrel-Moon-Sebastian-Meschenmoser/dp/073584156X. [Accessed 1 January, 2015].